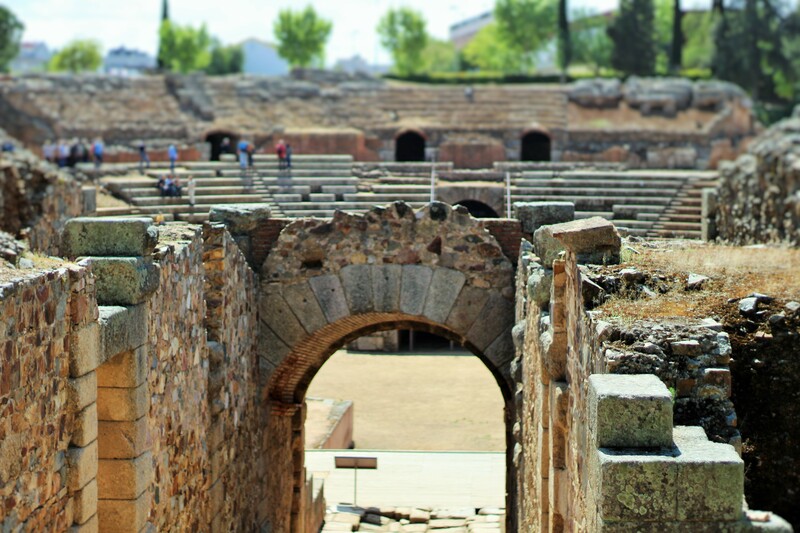 This weekend has been spent exploring Mérida in Extremadura, four hours south of Salamanca. 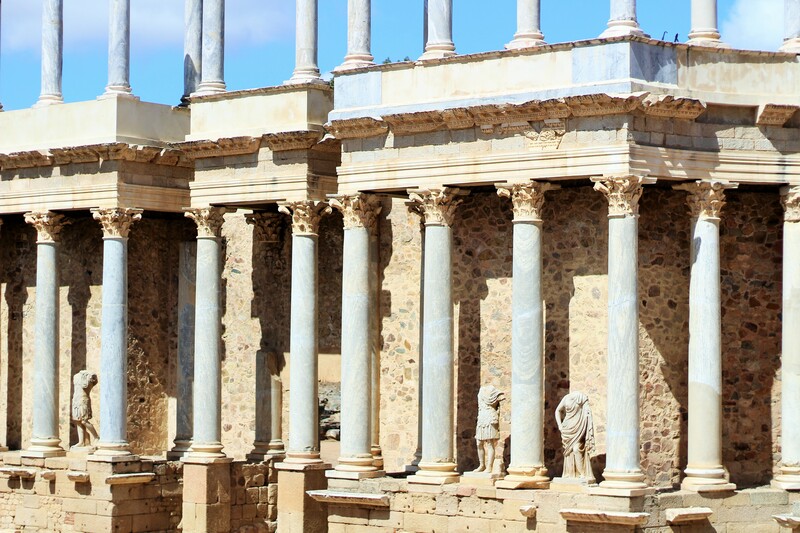 Mérida is home to some of the most impressive Roman ruins in Spain, which made it an excellent option for a weekend trip. As an ex-student of Latin and Classics, I was in the zone. Trying to remember how to translate Roman tombstones like five years had not past since my Latin GCSE paper. It is true that Mérida is a small town (or is it a city? ), and if you have the energy, you could see all the major sites in a day and be on your way. Personally, I prefer not to rush from tourist attraction to tourist attraction, it is tiring. Two days was enough to take it slowly, stop when we wanted, leave plenty of time to enjoy lunch and dinner and squeeze in a siesta in the afternoon. 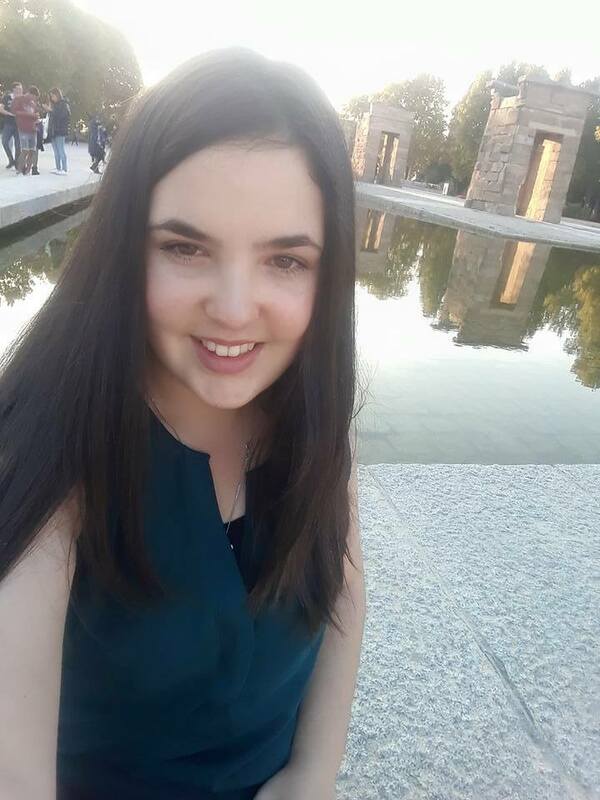 After arriving exhausted at 6am on Saturday morning after a total of 0-hours sleep on the coach from Salamanca, we walked across the river to our hotel, where we would hopefully be allowed to sit in the 24-hour reception area for a little while. We knew our room would not be ready, but with no 24-hour cafés/McDonald’s open nearby, we didn’t have much choice. Unfortunately our plan did not go smoothly. After a very rude welcome from the hotel receptionist, he bluntly told us he would not let us wait in the hotel reception and that we should ‘come back later.’ Explaining that no where was open for us to wait until ‘later,’ he still directed us to the door and locked it after him, throwing three guests (young girls!) into the street. Outside, in the cold and dark at 6am, with no where to go but a bench on the pavement, the thought of returning with our tails between our legs later in the day to such a horrible hotel was not going to be an option. 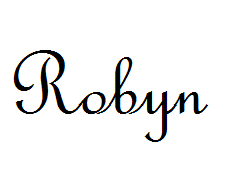 I am too proud and I know it, but no way was that acceptable. It is true that we had a rough start to our weekend escape, but I promise it gets much better. The decision to cancel our booking at the hotel and find somewhere better was the best decision we could have made. Getting up the TripAdvisor app on my phone, I searched for hotels nearby and we were directed to one which looked affordable and with good reviews. Standing outside the hotel, we panicked a little because it was a 5* hotel that looked very fancy, the Hotel BlueCity Mérida Palace. Three girls that look like zombies due to zero sleep with rucksacks on their backs, at 6am? Yep, I am sure this hotel gets it a lot. The app did confirm the room prices were in our budget, so we wandered in to check it out. It turned out they had a triple room available for us for only 40€ each and after handing over our passports to be scanned, the receptionist handed over our room keys as the room was ready, there and then. It was very difficult to not squeal with excitement at that moment, because all we wanted was a few hours sleep before we started to explore the city. We had a wonderful stay there, and it was such a relief after the horror of the hotel of doom. After three hours of much needed sleep, we dragged orselves out of the cosy 5* beds for a buffet breakfast. Definitely worth getting out of bed for! Soon, we were downstairs getting a map from the reception staff showing all the points of interest in Mérida. The attractions are spread across the city but as it is so small, are all easily reachable. 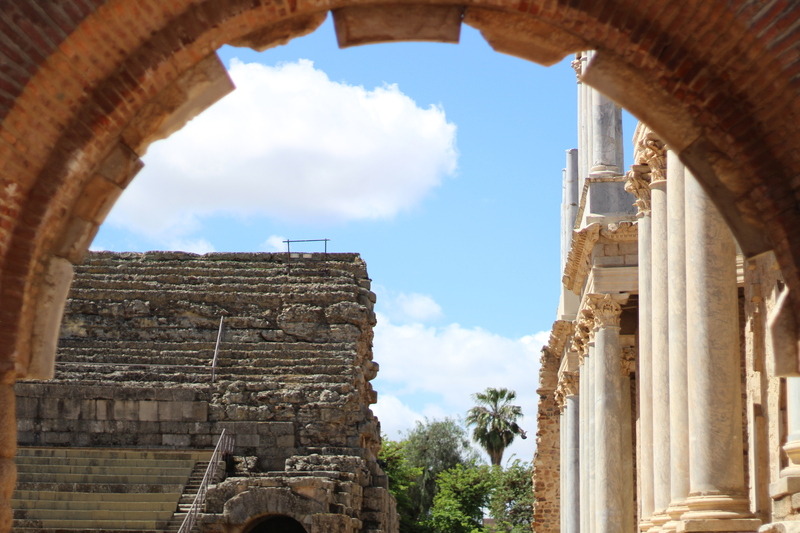 We decided to make our way to the Roman Theatre and Ampitheatre, stopping by the Temple of Diana on the way. 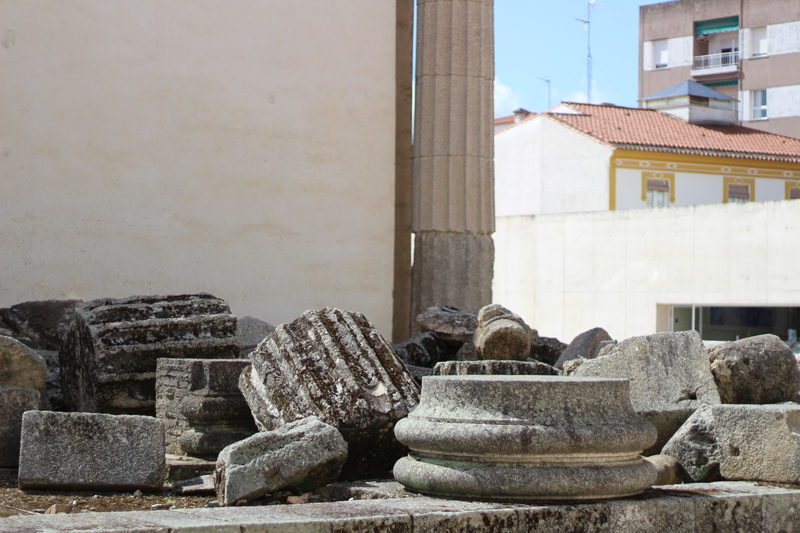 It is incredible to walk through the small streets as the second you turn a corner you may stumble across some ancient ruins which look so out of place. 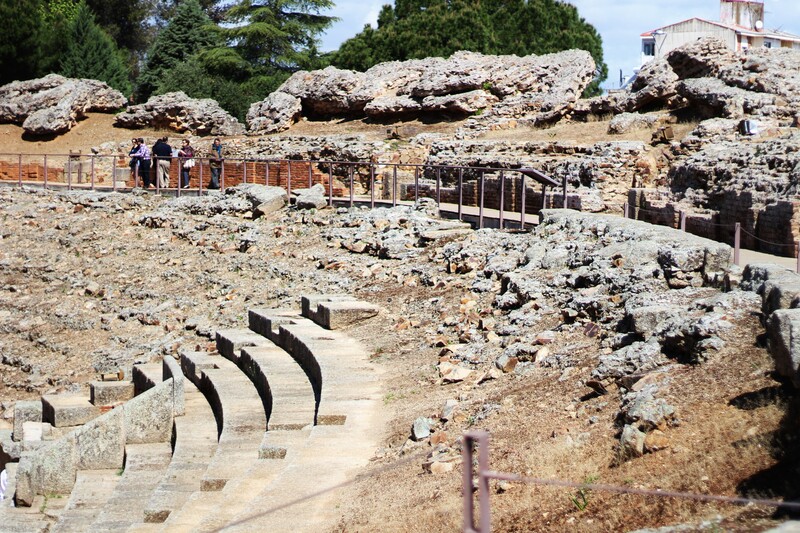 The next stop was the Roman Ampitheatre and Theatre. 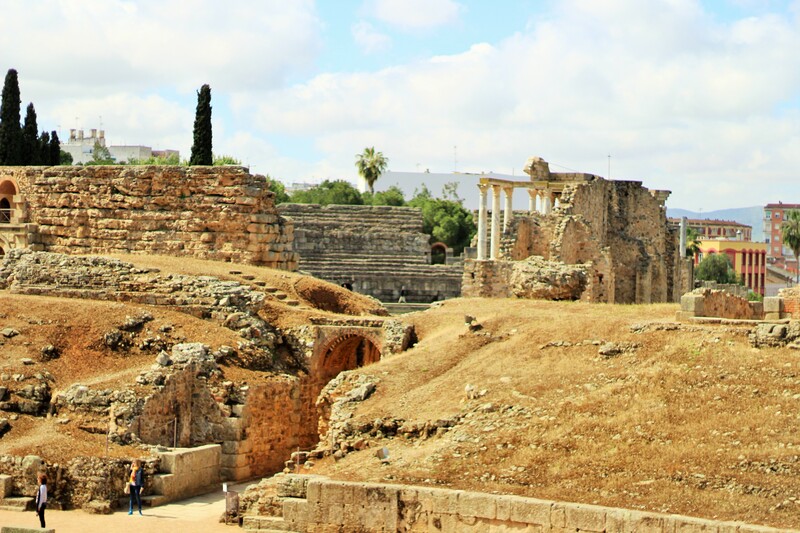 Entry to the sites in Mérida is 6€ for students to see six different sites, so that works out as 1€ if you visit them all. There is no time stamp on when you can visit so we were able to do the sites over two days no problem. My favourite place was the Teatro romano. It’s amazing to sit in the seats and feel all the history in such a place. I have been to numerous other theatres on my trips around Greece and Rome but it’s amazing to visualise it in front of you. As I will be in Lisbon until the end of July before I return to the UK, I am extremely tempted to extend my flight and get a return coach to Mérida (only 4 hours away) to see an Aristophanes play that is on in August. The fact that my housemate here has been twice and loved it is only making me want to go even more! 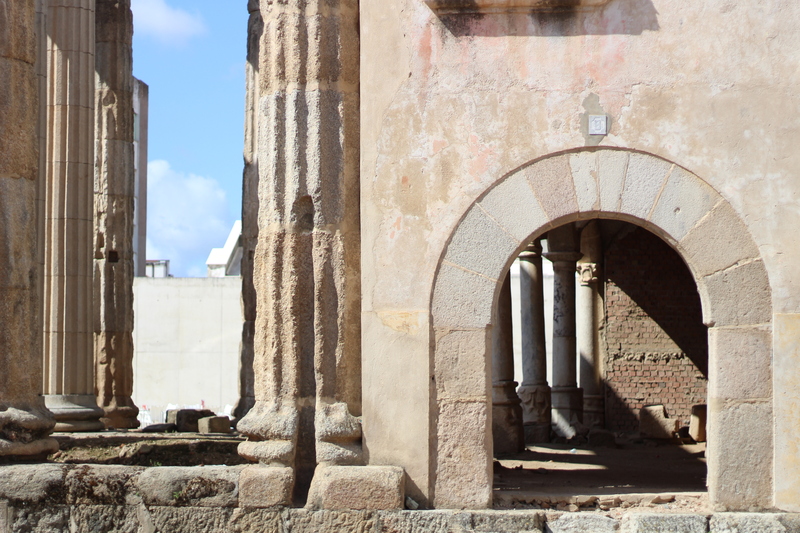 Check Part 2 for the rest of my trip to Mérida: exploring the Moorish Alcazaba, the amazing restaurants, the Acueducto de los Milagros, a creepy crypt under a church and more! 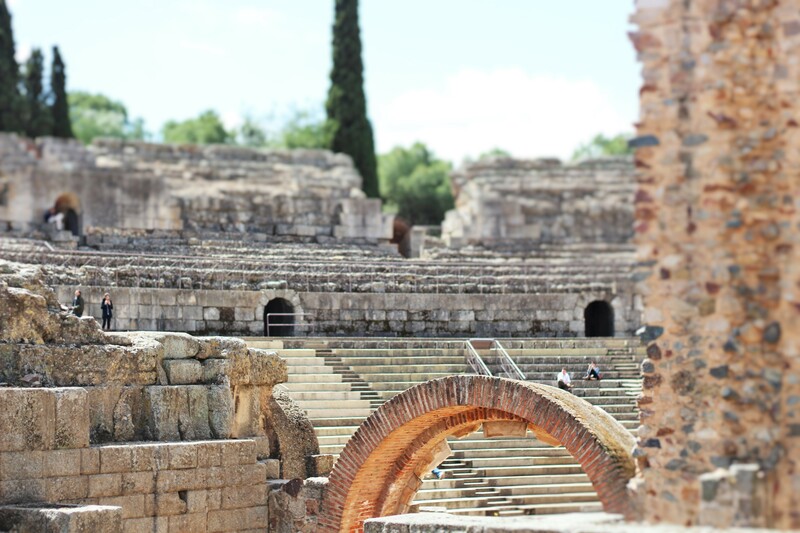 Would you be up for some Classical Theatre in a Roman Ampitheatre? Good post, gave me a memory nudge. I liked it there but preferred Trujillo. Ah, one of my flatmates is from Trujillo and said it’s beautiful. Definitely somewhere to visit in the future.